Christmas Ornaments Made in USA - 2004 Supreme Court Ornament - A Christmas Ornament Co. The A Christmas Ornament Collection presents 2004 Supreme Court Ornament. The 2004 Supreme Court Wreath Ornament represents the view of the Court building from One First Street, NE; Washington, DC. A look past the raised plaza, patterned with alternating squares and circles, brings you to the broad flight of stairs. These stairs lead up to the main portico. 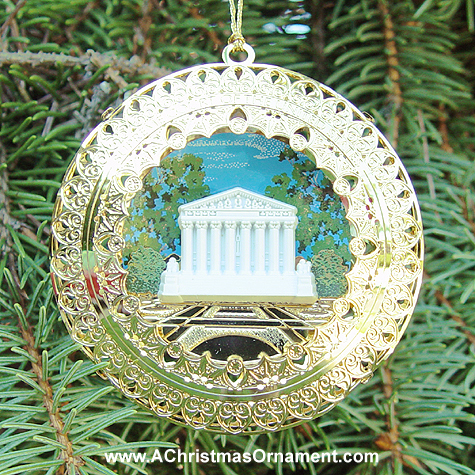 This 24kt gold-plated ornament is wreath-shaped with a resin insert of the front of the Supreme Court building. The filigree detail on the front and back of this ornament is derived from details found in the carpet design in the East and West Conference Rooms, and in the Library.